Today, Rohit Sharma is the most important member of the Indian batting line up after the incomparable Virat Kohli. In the last 4 years, the ‘HITMAN’ has scored a staggering 3702 runs including 16 hundreds at an incredible average of 64.75 and an astounding strike rate of 97.56 . Only Virat Kohli (17) has scored more hundreds in the last 4 years in ODI cricket than Rohit Sharma. When Rohit made his ODI debut more than a decade ago, there were the likes of Tendulkar and Sehwag who were the batting mainstays at the top of the order and Rohit’s job was to come in at No.5 or No. 6 and consolidate the innings. And so, in the initial years the big scores eluded him and many even labelled him as a ‘wasted talent’. It was only in the year 2013 after the likes of Tendulkar and Sehwag left the team, that Dhoni unveiled another master stroke of his by promoting Rohit Sharma to open the innings along with the dynamic Shikhar Dhawan. And from then on, the runs have flowed from Rohit’s bat. In the 108 ODIs since he started opening the innings, Rohit has scored a staggering 5487 runs including 19 hundreds and 25 fifties. His average of as an opener (58.37) is 26.65 points higher than his average of just 31.72 as a non opener. And what more, the mercurial Rohit and the dynamic Dhawan at the top of the order have worked wonders for India. In the 88 innings that the two have opened, they have scored a staggering 3992 runs including 13 century partnerships between them.They are already 4th in the list of most successful opening pairs in ODI cricket, headed by the legendary duo of Sourav Ganguly and Sachin Tendulkar. Coming in at the top of the order has opened up new dimensions for Rohit- he can now take his time to settle down, free his arms and take full advantage of the new ball and the field restrictions. And the gifted stroke maker that he is, Rohit has taken to opening the batting like how a fish takes to water. 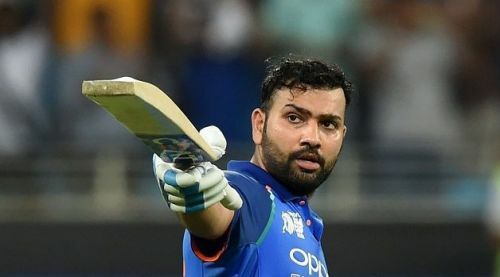 And once Rohit crosses the initial uncertain phase and gets his eye in, he is an extremely destructive batsman.There are few batsmen in world cricket today who can strike the cricket ball as cleanly as Rohit does. It is as if the worst thing that the opposition can do is to allow Rohit to score a hundred, because once Rohit crosses the three figure mark, he goes into overdrive mode and unleashes a brutal assault on the bowling. The sixes flow from his bat as if it is child’s play and in the last 10 overs, Rohit can totally demoralise the opposition. That out of Rohit’s 21 hundreds, 7 have been scores of over 150 and three have been scores of over 200 just goes on to show the ability of the ‘Hitman’ to convert his starts into huge scores. It acts as a morale booster not only for him, but also for the entire Indian batting line up. Rohit has scored 7454 runs and is already 7th in the list of highest run getters for India in ODI cricket. And with atleast another 6-7 years of cricket left in him, and the kind of scintillating form that he has shown with the bat, one can surely expect him to score runs by the bucketful and win a lot more matches for India. It has truly been incredible-the metamorphosis of Rohit from just another talented middle order batsman to one of the most destructive openers in world cricket today. And this transformation has not only cemented his place in the ODI team, but has also enabled the team to unearth a potential match winner from ‘just another middle order batsman’.